The first rule of concrete countertop sealants seems to be: don’t discuss concrete countertop sealants. Manufacturers are cagey regarding their proprietary formulas and seemingly nervous about industrial espionage. Still, most will admit there is no perfect, permanent sealer for concrete countertops. There are dozens of products and several types of sealer and wax for concrete countertops, all of which require careful application, care, maintenance and reapplication. “If you hear someone say they have a lifetime guarantee, they must also have the Holy Grail,” said Allen Miller, owner of Concrete Revolution, a custom concrete manufacturer in Denver. 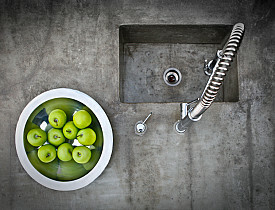 Concrete countertops are gaining in popularity partly because they can be fully customized with colors; finishes; embedded objects; and built-ins like sinks, drying racks, soap dishes, and more. However, Miller said finishing and sealing the concrete is one of the hardest parts of concrete countertop installations. “One of the trickier things is to make a sealer that is going to protect the concrete from the oils, vinegars and acids in our kitchens,” he said. Miller’s company makes its own topical sealer. He is reluctant to elaborate on the chemical composition of that particular formula, but widely used topical sealers include epoxy, urethane, lacquer, and acrylic films. On the upside, topical sealers generally resist stains and protect the surface from spills. Most also are food safe. On the downside, they can be scratched or burned. They are also tricky to apply well, and are prone to peel away (especially likely with products that promise to be “stain-proof”). Even when applied properly, topical sealers often look like a plastic film, and some argue they detract from the beauty of the countertops. Miller said he typically reapplies his topical sealant after 8 to 10 years, depending on the level of wear. However, the concrete requires little maintenance between applications. The other main sealant options for kitchen countertops are tung oil and other penetrating sealers, which soak into the concrete and resist scratches and burns. However, Miller warns against these. They're more stain-prone than topical sealers, so may age prematurely. Penetrating sealers are easy to apply in several coats with a paintbrush or sponge. Experts recommend maintaining a penetrating sealer with three coats of buffed beeswax or carnuba wax, then monthly rewaxing. A newer third option is a hybrid sealer. The most famous is a new sealer and wax system developed by Fu-Tung Cheng, concrete guru and author of several books on concrete countertops. The sealer is designed to penetrate the concrete and leaves a thin surface film. All sealers must be carefully applied according to the manufacturer’s directions, and DIY homeowners should consider “practice sealing” a chunk of concrete before marring a new concrete countertop. Be sure to apply sealers evenly and consistently, one full coat at a time. Let the sealant cure before adding wax. Don’t be afraid to leave the sealing and waxing to the professionals. When you hire an experienced contractor, he may not talk about the sealant but at least knows how to apply it.